how to (finally) make money off facebook! all those posts about what you’re having for dinner and your position on the election. all those status updates–single, married, it’s complicated and single again. all those photos of you at the aforementioned wedding and you tagged at the bachelor(ette) party! and those links to the song that captured the feel of the relationship status — the power of love, better that we break up, i will survive! all of that is worth money. a lot. like an estimated $86 billion dollars. that’s what facebook is valued at. and next week, for the first time, YOU have a chance to cash in on it. you oughta get SOMETHING for the time your cousin took a picture of you passed out on the sofa. i am in brooklyn visiting facebook friends. the neighborhood i’m in is full of folks who are houseproud. 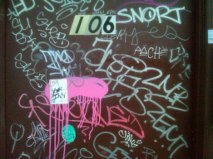 sometimes they decorate their front doors with modern artwork! how do you work this? how do you actually make money on facebook? first, get yourself a broker. fidelity, e-trade, oanda, charles schwab. tell them you want some. however, you should know that some brokerage houses are limiting who gets shares. for instance, fidelity investors must have $500,000 in qualified balances with the company. td ameritrade is allowing investors to grab some of the action if they have an account valued at at least $250,000. in addition to seeing new facebook friends, like #316 carolyn quinn on monday, i see facebook friends that i first met last year–like #58 john r. douglas. 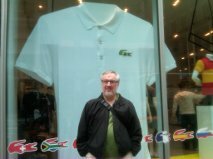 we were in manhattan, where everything is bigger, faster, louder, taller. . . . i told john this shirt was too big for him! some brokerage houses are concerned that investors will “flip” their shares and so they are also putting limitations on how long investors have to hold a share. fidelity will punish investors who resell their shares in fewer than two weeks with a bar on investing in future ipo’s. and investment houses are warning their clients that shares are at such a premium that there’s no guarantee that they’ll get any or all of the shares they want. so . . . what’s it all mean? facebook may be a great investment. there’s also a possibility that it will be all hype and no heft–online coupon company groupon and the radio company pandora bought saw their share value drop by more than 40% after going public. at that point, get out your wallet! 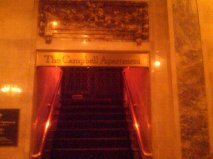 tucked away in a corner of grand central station in manhattan is the campbell apartment, once the hideaway of tycoon john w. campbell. he supposedly gave wild parties here. most commuters and tourists never notice this door. and i got ushered out of the hallway about two seconds after i took this picture. i pretended i didn’t understand english and allowed myself to be gently led back out onto the concourse. with much wealth comes many surprises. i guess mark zuckerberg understands that already! This entry was posted on Wednesday, May 9th, 2012 at 1:27 pm	and tagged with ameritrade, charles schwab, f2fb, facebook, fidelity, friendship, grand central station, groupon, ipo, mark zuckerberg, pandora and posted in Uncategorized. You can follow any responses to this entry through the RSS 2.0 feed. « sisters, sisters, there were never such devoted sisters!